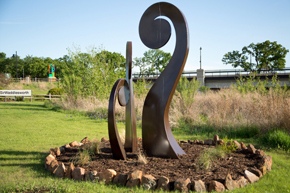 When out and about in Arlington, you must take a stroll along Arlington’s Sculpture Trail at Richard Greene Linear Park. 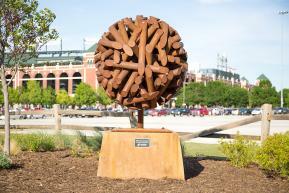 Part of the Entertainment District located between AT&T Stadium and Globe Life Park, the Sculpture Trail provides a thought-provoking environment to take advantage of the natural beauty of The American Dream City. Along the trail, you can experience between 15 and 20 different sculpture sites, potentially viewing around 40 sculptures. 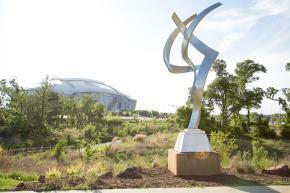 Every three years the sculptures will be rotated to allow patrons to experience a variety of art work. Representing the arcs that are produced when a football or baseball is thrown, “Arc 7,” created by Scott Shubin, dares to inspire people to continue on their own arc or journey towards their dreams. This 14-foot, chrome-powdered sculpture is made up of seven curved and straight steel tubes. Bruce Niemi learned to weld when he was 12 years old from his father, who was a sculptor as well. Having over 40 years experience in the fine arts, Niemi created “Celestial Trio” to showcase his faith and the symbolism of the number seven in the Bible. The three stylized number sevens are meant to be positive and uplifting and inspire viewers to use their own imagination and interpretation of what the sculpture means to them. Artist Amy Stevens has loved bees since she was a child. 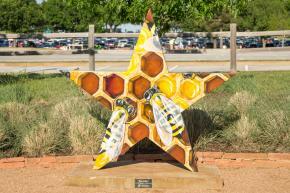 When asked to create a sculpture for the Arlington Sculpture Trail, Stevens knew immediately that bees would take center stage. The bright yellow, star-shaped piece aims to remind viewers that because life is hectic, it’s important to take time to appreciate the small things, to go outside and “bee” active in nature. 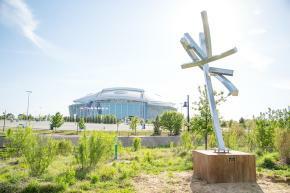 Created by Janna Tidwell, “Leave Your Mark” was inspired by the citizens of Arlington and how they have worked together to make the city better for all residents and visitors. 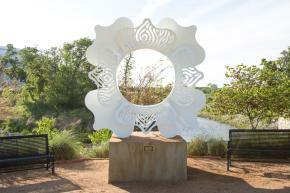 This 8-foot, 1200-pound white rose sculpture boasts fingerprints cut out of the sculptures petals, which symbolize the individuality of the citizens of Arlington and how they have made their impact on the American Dream City. The opening in the center allows patrons to view AT&T Stadium from one side and Globe Life Park and Six Flags from the other. Inspired by fern leaves, artist Pascale Pryor created “Fern Fronds” after realizing this shape occurs everywhere in the natural world. The piece symbolizes family and relationships and “the space we take in those relationships.” Made out of rusted and oiled steel, the sculpture seamlessly blends the power of the medium and the size of the sculpture with the gentleness of the curves and the meaning behind them.